Releasing their debut album Trollmarsj, I wonder what Norway's Fannefjell was hoping to accomplish. Another Norwegian black metal band with some folk nuances is hardly new. Singing, speaking, or growling, as is more often the case, is not new either. Could it be the story of some trolls, a mountain, and doing battle with humans for their existence that makes Trollmarsj different? Yes, that could be novel. Ultimately, the best part of Fannefjell's debut is the music, and not much more. Trollmarsj contains some of the best, if not conventional, Norwegian black/folk metal going in these times. 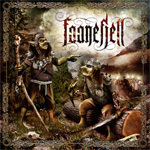 Fannefjell jells all the positive elements of thrash, black, and symphonic metal into a cohesive and entertaining form. But then there's those growling death/black metal vocals that, in this case, are rather ludicrous. Every reader knows that I'm not a fan of dirty vocals. They also know that I know when they are done well. In the example of Fannefjell's Trollmarsj they are a total distraction. Their musical skills and composition are exceptional, but the groggy growls distract from this. I would rather have them sing in their native (or archaic) language with no understanding, than bear this unnecessary distraction. With these reservations, there's some outstanding stuff on Trollmarsj. On point, Der Var Engang et Fjell, Slaat, Tre Tinner Bakom Bruem, and the instrumental Soknardair are masterful pieces in the black/folk metal genre (even if I don't understand the title or a damn thing they're saying). Fannefjell' Trollmarsj may not be my cup of mead nor my first choice in heavy metal, but they are truly on to something better in their chosen genre. However, the question remains: can Trollmarsj offer something braver and better than anything else out there. I hope so. Strongly recommended for fans of the genre.